Tristan Donovan’s new book about wild animals in cities is a departure from his previous books — about the history of video games and the invention of soda. Feral Cities: Adventures with Animals in the Urban Jungle has a broad geographic scope. Donovan recounts human-animal (and sometimes animal-animal) interactions in major cities in the U.S., Western Europe, India, and South Africa. The range of animals is equally, if not more, wide-ranging: rattlesnake, chicken, African land snail, starling, boar, raccoon, coyote, leopard, cougar, monk parakeets, yellow-bellied sapsucker, silver-eared bat, camel cricket, Norway rat, German cockroach, kit fox, and more. The chapters — 19 in total — are evocatively titled; for example, Singing a Different Song (songbirds literally sing differently in cities). Each chapter packs a lot of detail and you will find more in the References. This book is full of the natural histories of the wild animals that live in cities but it does not read like a text book. Donovan writes like a cross between a novelist and a science reporter (he has a degree in ecology). In addition to exposing details, Donovan assembles big picture concepts such as the how of sustaining wild animals in our cities (or “gardening a city to support beneficial species” per Rob Dunn) and mindfully co-exiting with wildlife, a theme Tim Beatley wrote about in a Biophilic Cities blog post. Below are some of my favorite details from the book. You can purchase a copy of Feral Cities at Chicago Review Press or on Amazon. My copy of the book c/o of Chicago Review Press. This review reflects my honest opinions. The red fox in Berlin does not behave like a red fox in a rural setting. The urban red fox does not make dens in the soil. They make dens in houses or basements. Ant The pigeon makes an appearance in this book! And we learn that we are complicit in the species — both the tame ones in dovecotes and especially the ones that rebelled — complete acclimation to cities. “Some rebelled, abandoning the dovecotes to make their own way on the streets, where he characteristics we bred into them turned out to be powerful assets. Tameness, speed, agility, fast-breeding, adaptable. Another surprising detail about the pigeon: not all pigeons rely on garbage. It is context dependent. In Leeds, 50% of a pigeon’s diet is garbage while in Prague, only 3% of the pigeon’s diet is human food. Half of Milan’s pigeon population flies to surrounding farms in the morning to eat grain. The other half eat human food in the Piazza del Duomo. Remember I mentioned that songbirds sing differently in cities? In response to urban noise and in some cases to the acoustic effects of surfaces and buildings, songbirds sing when its quiet, sing loudly, sing at different pitches, and sing shorter or faster songs. Speaking of less charismatic wildlife, Donovan cleared up an urban myth about rats. There is not a rat for every person in New York. Did you know that rats are wary and don’t like change? These traits make them suspicious of (poison laden) rat traps. We have created “sugar-phobic” roaches according to research conducted by Rob Dunn. In response to the sugar bait used by pest controllers, German cockroaches have evolved to taste sweet as bitter! Throughout Feral Cities we learn about our attempts to eradicate, moderate, and tenuously exist alongside weedy and charismatic wildlife. I’d like to end this review with an extensive quote from the last page of the book. It captures the next chapter in our ever-changing relationship with wild animals. …we’ve first got to stop thinking of cities as barre, anti-nature zones. This environment we’ve built, this urban biome, is teeming with life, but all too often we just blank it out. “I was in a meeting just yesterday and a wow was there from another zoo, and she made this statement that ‘I love it when kids from to the zoo. For many of them it’s the first time they’ve ever seen a wild animal,’” Seth tell me as we sit on that bench looking out over Chicago. And as I sit with Seth, I see the evidence all around us. The cliff swallows under the bridge. The rare black-crowned night heron standing in the water. The squirrels scampering up the trees. And out there in the city, beyond the oo, there are crows hunting dazed indigo buntings on the streets, ants nesting under the sidewalks, spitting spiders roaming apartments, pigeons pecking at crumbs, and coyotes snoozing unseen in the bushes. The city is alive. The wild is here, right on our doorstep, in our streets and inside our homes. P.S. 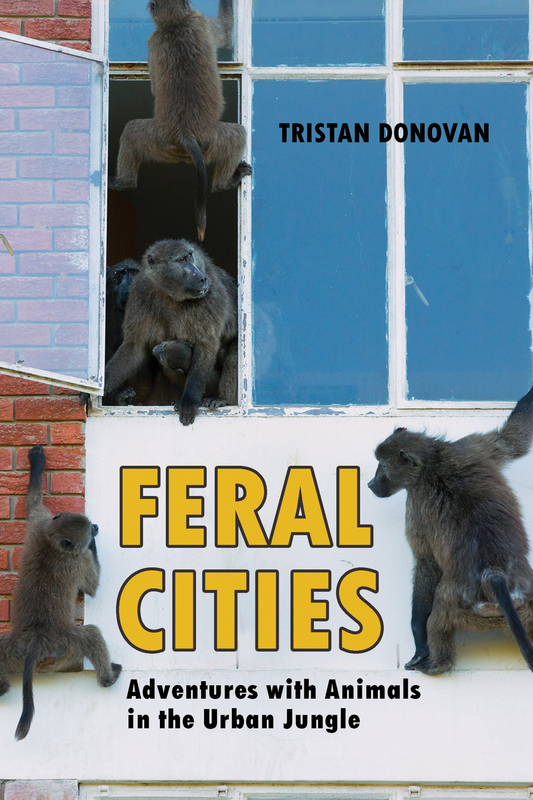 For more about Feral Cities, read Alissa Walker's Q&A with the author Tristan Donovan over at Gizmodo as well as Matt Soniak's 12 ways cities change animals and vice versa over at Next City. Thanks so much for posting this review. I love the concluding thought about nature in cities and how people are not seeing what is right in front of them, as in the pigeons, the squirrels, other birds.